I've never watched The Bachelor before this season. 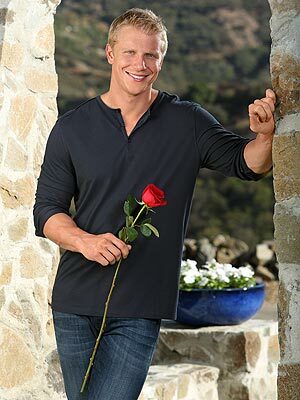 When I saw that this season's bachelor, Sean, is from Arlington, Texas, I couldn't resist watching. That's about twenty minutes from my house! That is one fine man. So my apartment floor was having a Bachelor party tonight because it was Monday night and we all share a guilty pleasure for watching The Bachelor. I figured I should bring something sweet for us to eat while we watch. I bought Oreos a few weeks ago, but instead of the normal Double Stuff ones, I bought chocolate-filled Oreos, which are not nearly as good as the Double Stuff ones. I decided to use them in a recipe since they weren't that great on their own. I found a recipe for Oreo Cheesecake Bites. I sort of used the recipe on the link provided, but I definitely made some modifications. They were AMAZING. They were even tasty enough to get me through all the stupidity Tierra put us through tonight. 2. Line a 9x13 pan with parchment paper, leaving the parchment large enough to go up two of the sides to allow for easier removal. 3. Smash 20 Oreos to smithereens in a gallon ziplock. Add the melted butter and squish it all around. Make sure all of the Oreos have some of the butter on them so they stick together. Press the mixture into the pan. Bake for 10 minutes. 4. Beat the cream cheese in a bowl until it's light and fluffy. Add the sugar and make sure it's completely incorporated. Add the sour cream, vanilla, and salt. 5. Add the eggs and scrape down the bowl. Make sure everything is completely mixed with no chunks. 6. Crush the remaining 16 Oreos (not completely smashed, just broken up into pieces). Gently stir them into the cream cheese mixture. 7. Pour this onto the Oreo crust. Bake for 40 minutes, or until it's slightly jiggly in the center. 8. Put it in the fridge for at least two hours. Run a knife around the edge and use the parchment paper to remove it from the pan. Cut into desired size (I did about 1.5x1.5). Make sure to wipe the knife on a paper towel between each cut. 9. Melt the white chocolate and add a little bit of vegetable oil to smooth it out. Put it into a sandwich baggie and cut the very teeny tip off of the corner. Drizzle the chocolate on each square in a decorative pattern. Let the chocolate harden in the refrigerator for about 5 minutes. Enjoy! I'm still rooting for Sarah. Here's to Tierra being kicked off next week! Thanks for stopping by Neighborfood to comment! I'm glad you enjoyed the Chocolate Cake. Back in college, my roommates and I always watched The Bachelor together. Some seasons we even made brackets to see who could determine the winner! I miss those girl's nights. Such fun times!